Say hello to 12 year old Camille again haha! It’s been a long time since I last wore my ruffled lace socks. I just couldn’t help it! Bayo’s collection of sweet and preppy items are just too cute not to be styled this way. My favorite piece is actually this lavender-colored top. It’s too sweet for words really! Aside from its powder color, the thing that attracted me the most to it is its huge peter pan eyelet collar. It even has scalloped ends!!! And look at its sleeves! They have ruffles on the ends too! ACK! CUTE! If this top had cheeks, I’d pinch them like crazy!!! Bayo’s aesthetic has always been sweet, dainty and feminine so it wasn’t hard to put this outfit together. Trust Bayo to have the sweetest color palette available. To match my pastel top, I got this blush-colored cardigan to wear over it. It’s too bad this photo is a little too light so you can’t see that it’s a little bit sparkly. I couldn’t resist stealing this clutch from sister. She was actually away on a business trip when I got this. Har har. Now she knows I sneakily stole it. But can you blame me? This is the most charming clutch I’ve ever seen. I mean look at the paint brush on top! So here’s my peace offering to my sister, kisses! O, priceless yan! LOL. hi camille, i love your outfit especially your clutch. do you order your kate spade bags and clutches online? i love your style camille. you are my fashion inspiration. and i grew up loving to wear anything and everything that says girLy in its sense! Alright, alright. Ms. Camille, how can you grow younger? =)) You look so lovely. It’s so funny for you to steal your sister’s bag! Ohh this is why I always prayed for a big sister. Not to be sipsip or anything haha, I want to tell you that I really wish if I ever did have one, she’d be like you Ms. Camille. So funny, loves fashion, intelligent and so down to earth! Thank you Kyla! :) I wish I had a younger sister too! you’re sister’s clutch is so lovely. I looooove the feminine vibe on you!! May it be edgy or girly, you rock it. :> And your clutch, oh I die. Haha! I wish to have one of those in the future maybe. :)) And also, I want your shoes! Can you donate them to me? Haha kidding. Hahaha! Thanks Rachael! Basta drop by BU4! Oh my! I totally dig this look. And the clutch! So playful! :) Love it! Haha thanks Kaye! :) I wish I have a younger sister too! So cute! 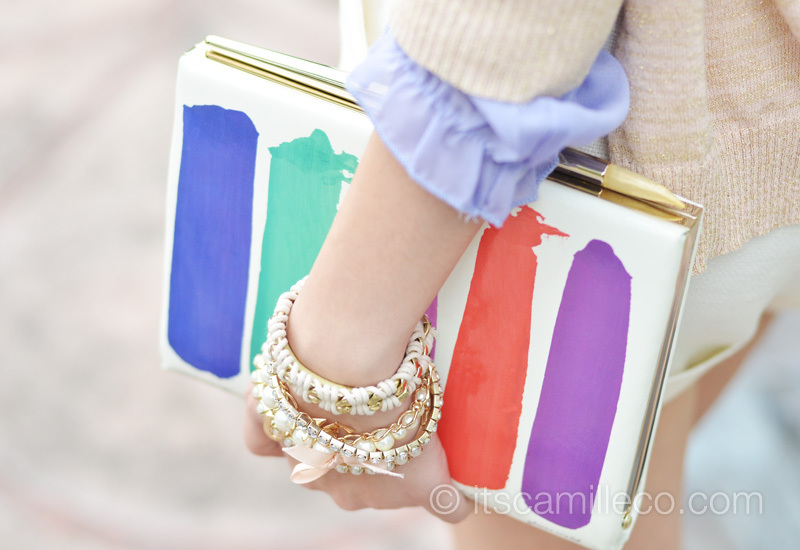 I really love the bag it’s so chic and playful :) And oh, I love everything on this blog!! o nga, hirap nang maka-arbor, ikaw pa kaya! Haha! Thanks Jhaycee! super love your outfit ms. camille.super fresh.love your lippie too.may i know what shade? thanks much! Lovely!! cute bag and shoes! I love your top and clutch. Your last pix is sooo cute! :) I remember wearing those kind of socks when I was still a kindergarten.hahaha. Hindi pwede haha How about me? What will I wear? Haha! :) Thanks Jana! I think it’s light brown? A little blonde? 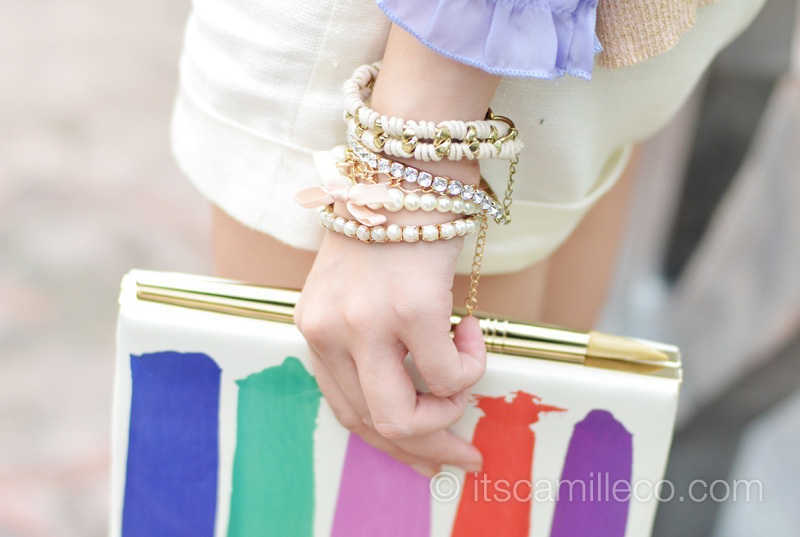 I LOVE LOVE LOOOVE that clutch! So unique and pretty! Thanks Alice! Don’t cry! Maybe some day? Nothing is impossible! :) I wish to visit Germany! That clutch is GORGEOUS! and i love the socks with the chunky heels :) Great look Camille! Thank you Reena! So heartwarming! I’m happy you’re more confident now! Meron naman :) Very very light lang :) Thanks Emmrose! Awwww :( But I have good news for you!!! The bazaar is until December 16! :) Cheer up! Thank you Lee Mae! :) See you soon! I REALLY LOVE this look.The socks are so adorable! I’m sure you can! I’m no beauty queen! Very girly and dreamy. I so love your last photo. We see your kalog-side everyday on your blog. I’m such a big fan, Ms. Camille! Haha. I wish I have the chance to see you in flesh! You have! Visit kasi Bloggers United! :) I can’t help not being kalog. Even my friends get exhausted haha! You look so cute here! Haha. For a moment there I thought your bag was a nitebook. You know the binder thing :-D nasobrahan sa imagination!! Waah! Sobrang cool lang nung clutch! Di mo talaga akalaing clutch ung hawak mo… it looks like a toy… basta hindi xa mukhan clutch!hahaha swear! Pero I love it! super unique! Thanks Clara! I’m loving lavender! Achi! :) She still might hahaha but oh well! Aaah, this is so sweet and romantic! I love the top and the lovely sweet coloured heels with the cute socks in it! Cutie~! It’s like having a flashback to kindergarden with the lace details, hahaha! And I looooove the clutch! Who knew paintbrush strokes could be an awesome bag design?